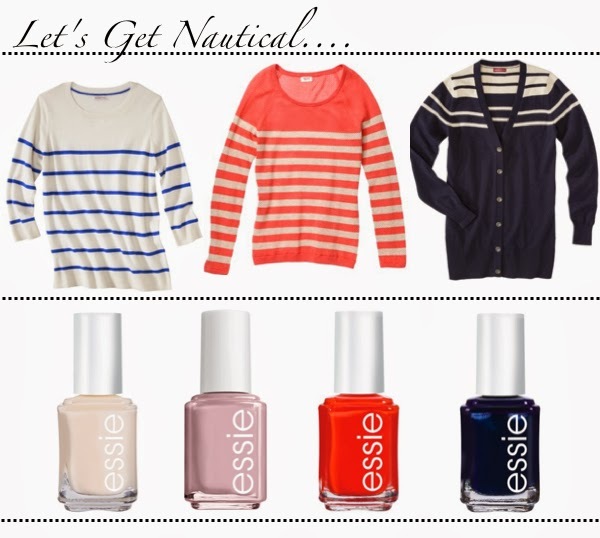 I'm teaming up with Target to share with you how to style the nautical trend this season. Let's get down to basics... a simple striped sweater is essential! Pair it with your favorite boyfriend jeans for a low-key yet pulled together look or pair it with an unexpected pop of color, such as a neon pink pencil skirt, to give it a modern twist. Less is more when it comes to this trend- there's a fine line between nautical and looking like you just got done yachting! The finishing touch to any outfit is a fresh manicure. I prefer the Essie nail polish line since they have an amazing color selection and it always lasts a fair amount of time too. This post is sponsored by Target but all opinions are my own. I love nautical theme, especially when it comes to outfit style ;) I love the nautical stripes especially the white/navy ones.